As I have said many time, the simpler, the BETTER! I know no-one has time to slave in the kitchen after work, but this Summer Salad is the quickest and yummy go-to. It works as a main by adding some protein, or as a side! You can jazz it up with Silvered Almonds, Sesame Seeds, Chia Seeds, or one of my fav is green beans, baked carrots or zucchini. Literally a 10 minute salad for those hot nights when you come home and need something to nourish you after a long day. 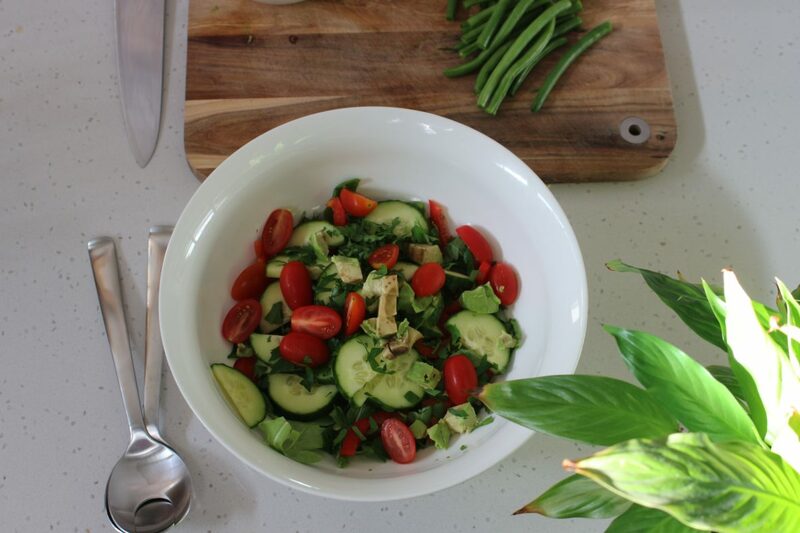 By quickly chopping some fresh herbs you are making your salad go from meh – to a powerhouse nourishing bowl of goodness! Parsley is full of vitamin K, C & A, as well as a good source of folate and iron. If your a pregnant mamma, add some Parsley to your dishes and up your folate! If you need more fiber in your diet, throw in some coriander. I personally LOVE coriander, but I know its not always top of peoples choices. If you want to make, it feel lighter, or you get bloated from raw veggies, add some mint! Mint is fantastic at aiding digestion. First make your dressing, squeeze half of lemon into jar, or something you can shake. Add dash of Olive Oil and Garlic Oil. Add generous amount of pink salt and cracked pepper. Tablespoon of Apple cider vinegar. Shake well and set aside. Add into your salad bowl, Rocket and Spinach. Dice your Cucumber, Capsicum and Avocado. Add all ingredients to bowl, drizzle dressing and mix. Finally top with crumbed Goats Feta and Balsamic Glaze. You can mix it up with the herbs you add, Basil, Mint, Coriander and Parsley all wok! If you made this and added something different I would love to know.